Four months ago, Google executives said the company had a new, laser focus on artificial intelligence. On Tuesday, the company launched Allo, a smart messaging app for Android and iOS platforms that uses A.I. to help users express themselves, accomplish more and find more information within their chats. The app was originally unveiled at Google's I/O developer conference in May. It's part of a new wave of A.I.-powered technologies, smart products and services that Google hopes to keeps the company ahead of its competitors. "Whether it's planning a night out or just catching up, we all rely on messaging to stay in touch with friends and loved ones," wrote Amit Fulay, a group product manager with Google, in a blog post. "But too often we have to hit pause on our conversations -- whether it's to check the status of a flight or look up that new restaurant. So we created a messaging app that helps you keep your conversation going, by providing assistance when you need it." Google Allo is the company's first messaging app that uses A.I. to learn how users like to communicate and express themselves. For instance, with a smart messaging app, if a friend sends a photo of a new car, Allo will offer several possible replies, like "Great car!" or "Let's go for a ride." At Google's I/O, the company also took the wraps off Assistant, a virtual assistant, as well as the Google Home device and the Duo video chat app. The Allo app also includes Assistant, and can offer suggestions such as emojis to go along with responses in a chat. Chatting with friends about the big game on Thursday night? Assistant can search for team stats, dates for upcoming games, photos of team players and other information. "This is a pivotal moment in where we are with the company," said Google CEO Sundar Pichai at Google I/O in May. "It's not just enough to give people links. We need to help them get things done in the real world. We've been laying the groundwork for this for many, many years." So will the launch of Allo mean Google is on its way to succeeding with its A.I. road map? "It's really important for Google, as the company has bet its entire future on A.I.," said Patrick Moorhead, an analyst with Moor Insights & Strategy. "Their CEO Sundar Pichai said at I/O his company is no longer a mobile company, but an A.I. company. Allo needs to go really, really well. They're on stage here." 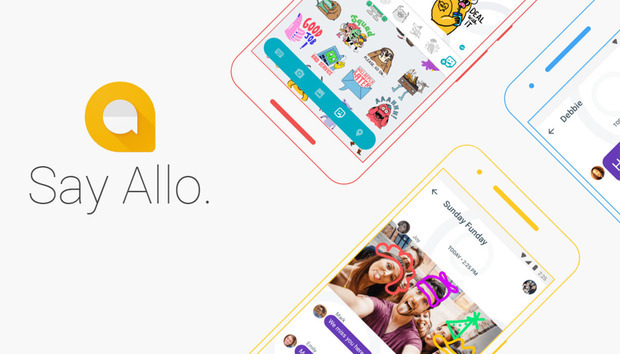 Rob Enderle, an analyst with The Enderle Group, said Allo could be an advance for messaging, as well as for Google. But it also carries risks. "The competitive advantage is the A.I. engine, but the A.I. is young and, as yet, poorly trained, so like a baby on a plane, generally more annoying than beneficial at the moment," he added. "You have to start someplace." To Jeff Kagan, an independent industry analyst, Allo's combination of a messaging app with A.I. shows promise. "It creates a fertile new playground full of growth potential," he said. "With all that said, it feels very intrusive. In order for users to get the benefit of A.I., they have to give Google permission to scour their devices and uncover every contact and message and personal bits of information in their life." With both the advantages of a smart technology and the disadvantages of what some are calling an intrusive technology, it's no sure-fire winner. "This is both a blend of ultra cool and privacy busting technology," said Kagan, noting that it could still be a popular app. "Middle-aged users today remember privacy and miss it. The youth, however, were born into this world of no privacy, so they don't mind as much."